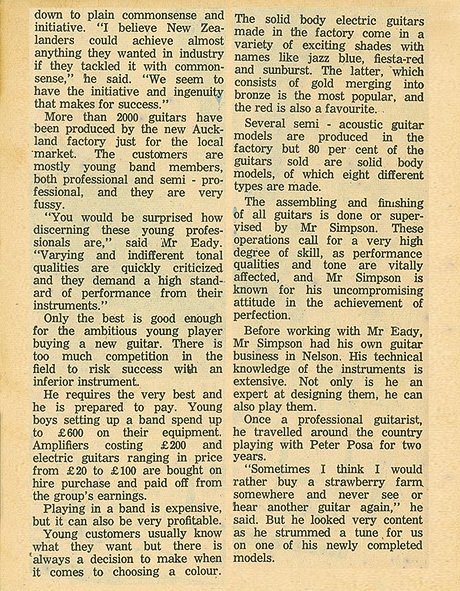 The following article featured in the New Zealand Woman’s Weekly, February 10th 1964. Bruce Eady (was there ever an Eady not involved in music?) 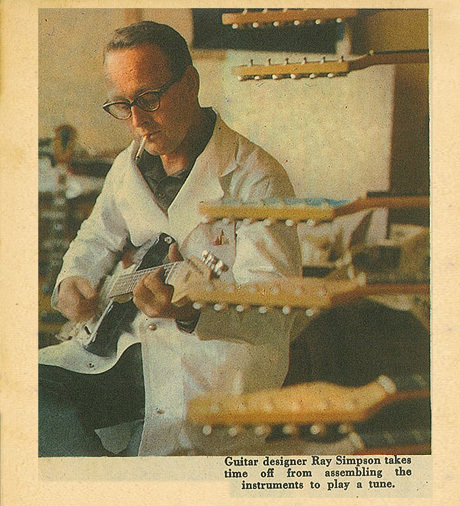 as owner, and Ray Simpson as engineer were the Jansen Guitar Company; responsible for electrifying clubs and suburban bedrooms and garages with the very popular Invader. 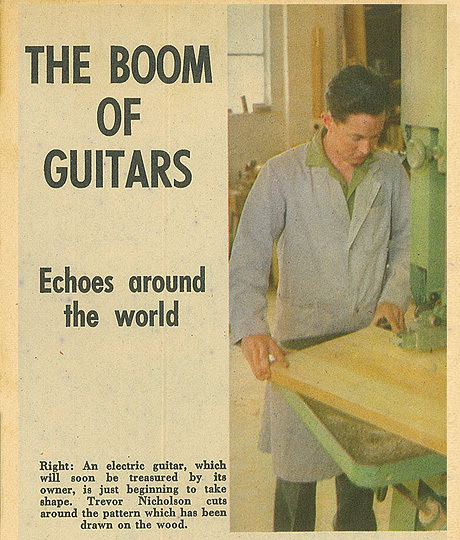 Alan also recalls one of Ray Simpson’s 1940’s pioneering electric guitars, “Ray holds the honour of building one of the world’s first solid body electric guitars (1945)… it was a portent of things to come.. but what was interesting (and dangerous!) 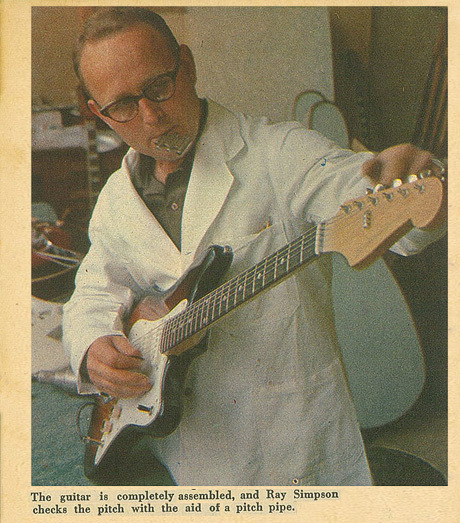 was that it had a mains powered onboard valve preamp, along with electrostatic pickups! 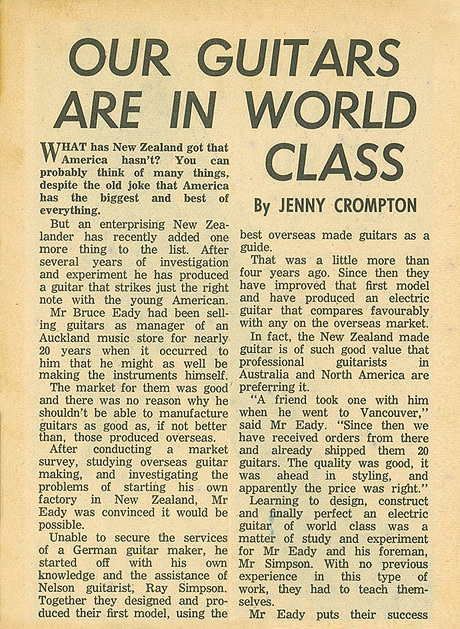 Ray went on to form his own company in Auckland and manufacture his range of Simpson guitars”. The Kavaliers were led by Freddie Keil of the all-star Keil family. This entry was posted in Music and tagged Bruce Eady, Early electric guitars, Electic guitars, Freddie Keil, Jansen guitars, Jansen Invader, Jansen Jazzman, New Zealand guitars, New Zealand Music Month, Ray Simpson, solid body electric guitars, The Kavaliers. Bookmark the permalink. 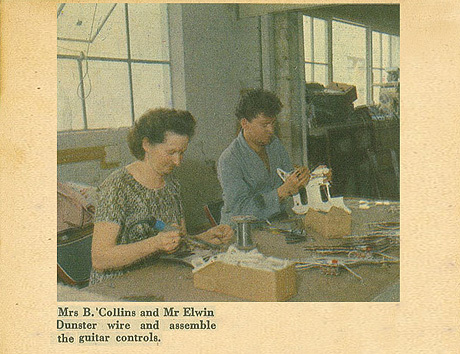 Ive been told that my Grandfather Jack Collins was one of the founders of Jansen Guitars with Bruce Eady in 1959. Hi Shawn, a few weeks back I did receive a comment from Jack, I have only just had chance to respond. Good to hear from you both. Cheers P.
My name is Jack Collins, I’ve lived in USA since 1966. Before that I was chief engineer and factory manager for BBG and built the first prototype Jansens in my garage in Hamilton. Hi Bruce, sounds like a neat project, while I completely emphasise with the purest, often, particularly as things get older, they can deteriorate beyond facsimile restoration and need to be given new life. I like that, a bit original/saved, a bit repaired/transformed. Good luck with your request, there might be some good Kiwi no. 8 wire suggestions from folk too! Hi Paul. Thanks for your encouragement. This is therapy for me as I live in hospital, due to slow but disabling bone cancer. A couple of things I should have mentioned before: I think this is a very early Jansen, maybe 1964-5 era, and it has a 29 inch scale. 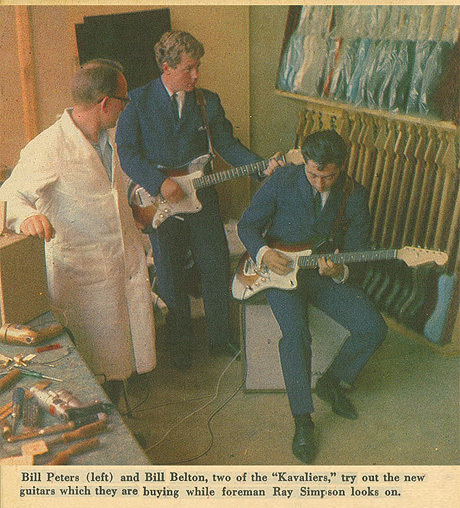 The pickguard and body look identical to the guitar that Bill Belton is playing in the newspaper article above. The pickguard is fairly rough, and has no edge treatment at all. The mods consist of 3 micro switches designed to isolate the neck and bridge pickups individually, and there is a 4 way knob switch which looks like it operates a series of different treble bleeds. It has had a nail glued into the side of the knob which is probably so one can see of feel the setting in the dark! As the electronics were not working when it was sent to me due to incorrect grounding, I have not yet tried it out except for testing all the connections with a multimeter. All that needs to be done now is refinishing the machine head and fitting the strings. Cheers, Bruce. 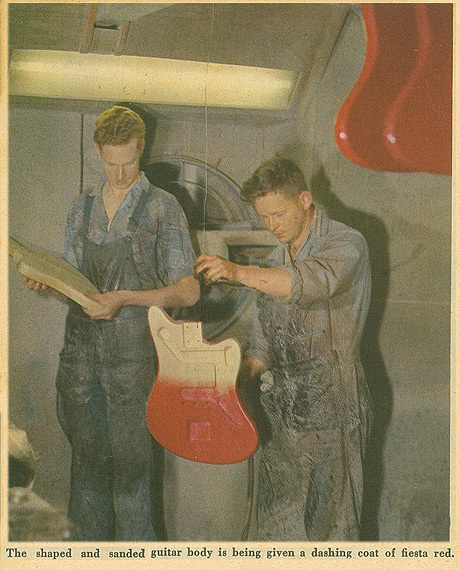 I have a bass neck (4 string 30.25 inch scale) and a loaded bass scratch plate( looks like the one the ladies are working on in the newspaper photo).I think from a Simpson instrument. Can anyone please help me with info. photos etcetera? I am a professional luthier. I have restored a number of Simpson and Jansen instruments . Hey Stephen, hopefully someone will be able to oblige, I will see if I can make a higher quality scan of that particular picture from the magazine article for you. Cheers, Paul. Ray Simpson was my Father, and since his passing away a last year, I was trawling the net and came across the Woman’s Weekly article hence your blog. 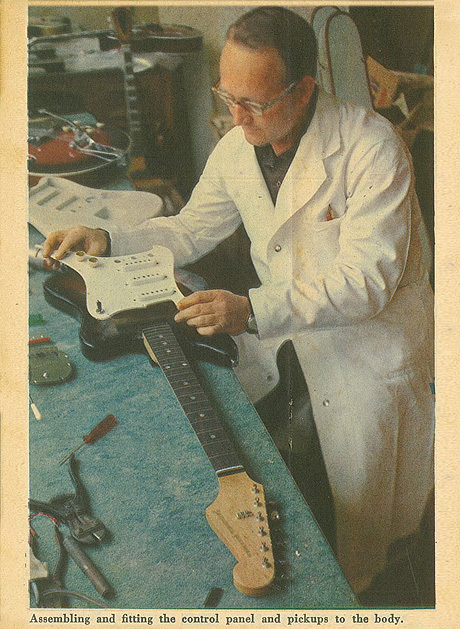 I remember when I was a kid assembling the pick ups for his solid body electrics in his workshop under our house in Birkenhead. 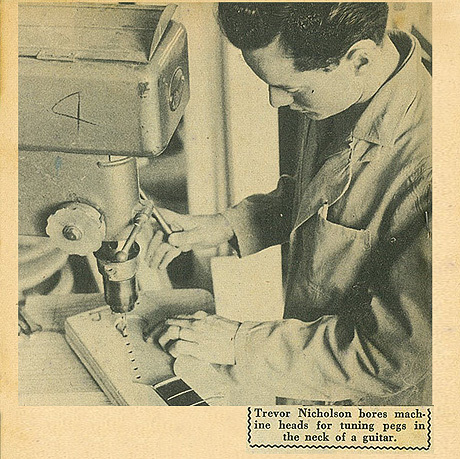 He also made several acoustic guitars, which were amazing for their level of workmanship. I have in my possession one of his first prototypes, He restored it in his old age after it had done the rounds in bands. I would be happy to send a photo of it if you want. Thanks for writing, sorry to hear of Ray’s passing. I think it would be very cool to see the prototype, am sure the other contributors to the story’s comments would too. Helping your father out sounds pretty neat, and how very Kiwi… “in his workshop under our house.” I will send you and email. Thanks for getting in touch. Cheers Paul. Jansen is still going strong 64 years after inauguration as BBG. Locations have changed and staff have changed but the product was top quality until 2001 when the last product left the production line. Jansen now imports all product on sale. I have been working for Jansen since 1968 seeing the change from valve power to solid state power. Lowrey, Acetone and other organs were assembled and sold until the market evaporated or changed by import regulations which required a high local content until Roger Douglas lifted all requirements and anyone with a haybarn could import and sell without any manufacturing process at all. If you were one of the staff, please enter a reply here. 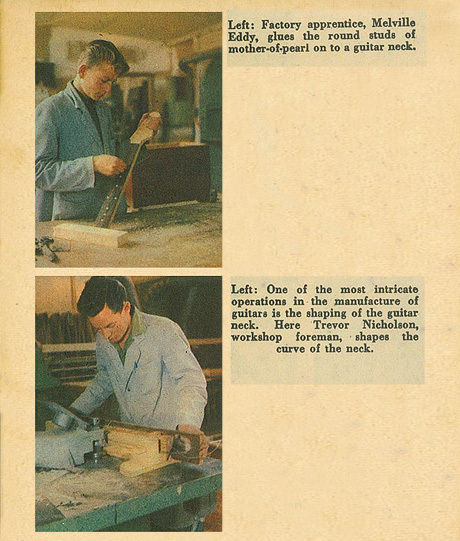 Hi John, wow, you will have seen some great gear – and some fascinating changes over the years. My first guitar was an Invader (man, I’d dearly love to have that still! 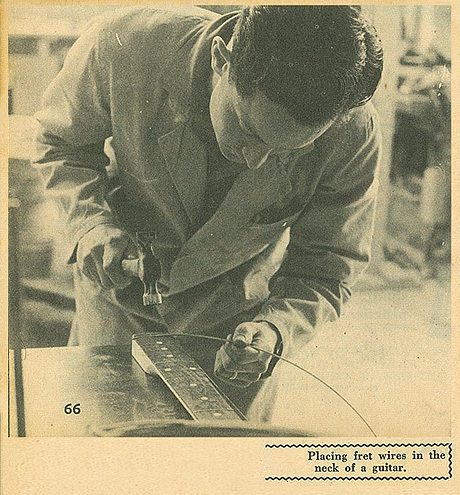 ), and have had cabinets made, speakers repaired etc by Jansen over the years. I agree that the 80s were a time fraught with poor policies that saw a myriad of industries struggle to compete or disappear completely; we are much the poorer for it. I welcome your suggestion of other staff getting in touch here. Cheers John. Paul. 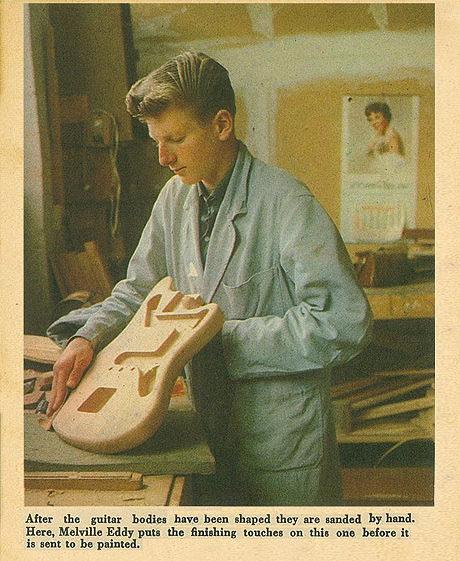 A very interesting story about a classic guitar-maker.